This post contains spoilers. It must, or it wouldn’t be very long. Behind the Door isn’t very long itself. A healthy chunk of it is lost; what remains has been pieced together from several sources; the still-missing material now accounted for, onscreen, by a series of text explanations, inserted into the film by the Library of Congress, to whom we are, of course, grateful. Behind the Door is a rare one, after all—unavailable on video or almost anywhere else. (I saw it at Cinefest 33, in Syracuse, NY, in mid-March.) 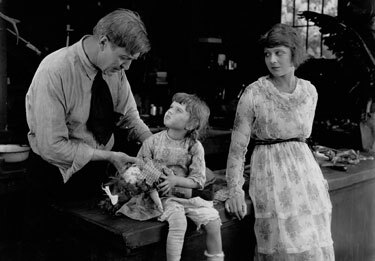 But it’s not the film’s rarity that makes it so interesting, or really, worth writing about at all—lots of silent films are lost, and lots of silent films are better than Behind the Door. What sets this film apart is the way it ends. Cinefest’s program notes were positively spooky: “One of the most gruesome and bizarre of the atrocity films made in the United States between 1917 – 1919,” they read; “the queasy might want to visit the Dealer’s Room.” I ought to have read them by candlelight. The next best thing, perhaps, was to watch the film late at night; which I managed to do: huddled in a conference room, in the dark, with more than a hundred other curious fans, few of whom had seen or heard of it either. Most of Behind the Door run-of-the-mill, to tell the truth. Made in 1919, but set in 1917 (and 1925—more on that in a minute), it tells the story of America’s entry into the First World War, focusing on one man’s attempts to serve his country despite his German heritage. This is quite a bit less interesting than it sounds, since the man in question, Oscar Krug, is American-born; part of a family that has lived in the U.S.A. for generations. His patriotism is unimpeachable; indeed, so is his character. On paper, this makes the 180-turn some villagers take on him a tragic thing, but in practice, it is hard to believe. Things will turn out badly for Krug. We know that, since we first meet him as a decrepit drifter, returning to his sea-side village in Maine eight years after the main story has ended. Travelling back to 1917, we see a younger-looking Krug, though he’s still not youthful. 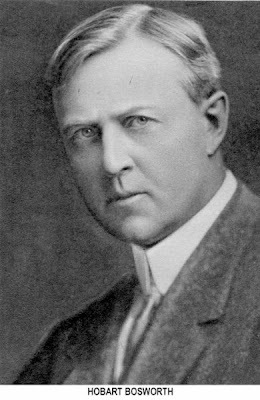 Played by Hobart Bosworth, an actor already in his mid-fifties, he has the weathered look of an ex-seaman: tough, looming, firm-gripped; but starting to wear down. 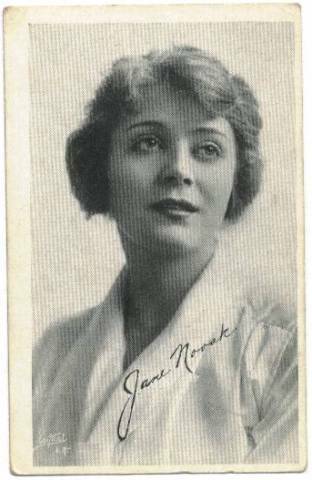 Krug has eyes for only one lady: the vastly younger Alice Morse (played by Jane Novak, then in her early-20s.) Nothing is made of the age difference. However, Krug’s interest in the girl puts him at odds with others in the town, who share his taste, and when war is declared, Krug’s heritage becomes a point of vulnerability for him. For a while, I thought the title of the film referred to the door of his shop. It is upon this threshold where Krug (a taxidermist) makes his first stand against the village mob. It is quite the brawl. One of the things that tips you off to the weirdness to come is how violently Krug’s fistfight with one of the villagers is photographed. Director Irvin Willat pulls us in close, practically face-to-face with the combatants. And the action is bloody. Krug beats the hell out of the other man, enough to nearly kill him, and though the two reconcile immediately afterward, this sequence will still shake you up. You simply don’t expect such scenes in a silent film. Events progress rapidly. Krug enlists; marries his sweetie; leaves his village full of idiots behind, and becomes captain of military ship. Alice, through subterfuge, manages to join him onboard. And soon the ship is torpedoed by a German U-boat. 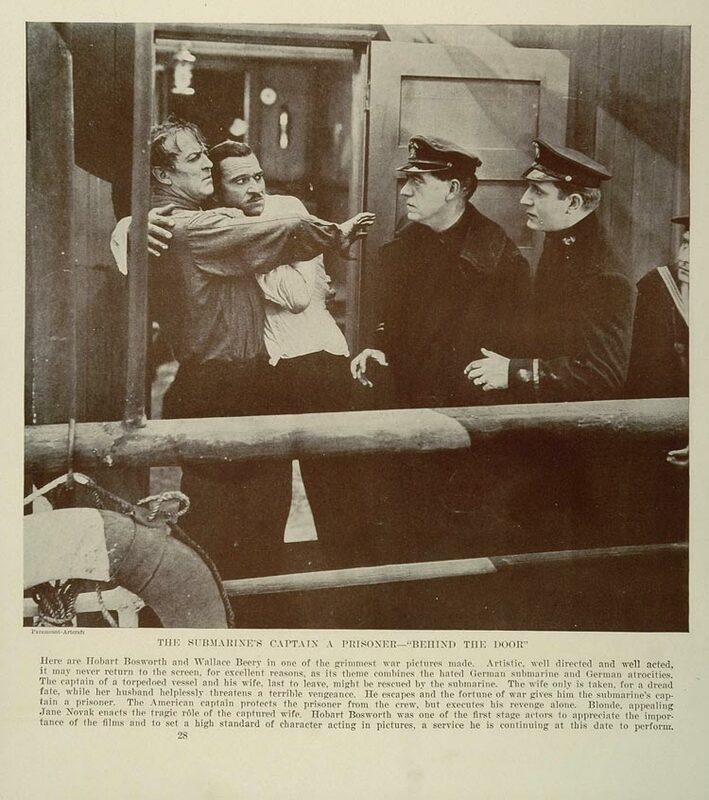 The commander of that U-boat is Lt. Brandt, played by Wallace Beery at his sleazy best. You want your Depraved Hun stereotype? You got him. Alice is taken aboard the sub and Krug is left behind, adrift. 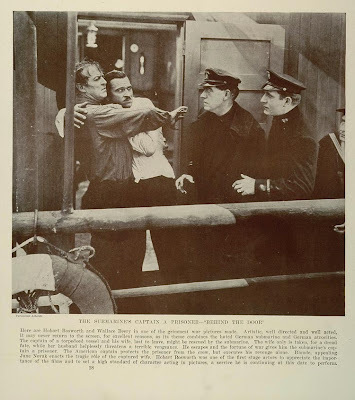 Later, Krug returns the favour, sinking the U-boat and taking Brandt aboard his new vessel. He locks himself in his quarters with Brandt, and begins questioning him about the missing Alice. The whole film has been building to this. Regrettably, all scenes between Alice’s capture and Brandt’s are missing. I wish we had them, because they might have illustrated Krug’s state of mind during that period. Yes, of course he’d be distraught, but any man who locks an enemy combatant in his room, pours him a glass of champagne, then proceeds to question him about events that can only drive the captor to criminality of his own, is, we suspect, already off the deep end. There is one more door of note. One in Krug’s quarters, behind which Brandt is gagged, hung, and stripped to the waist, after telling his tale. Sometime after that, Krug invites a couple of crewmen to have coffee with him. “I was feeling lonely,” he explains, pouring coffee and hitting mostly saucer. Where’s the prisoner? the two men ask. Krug directs them to the door. They open it and recoil. “I swore I’d skin him alive,” Krug seethes. “But he died too fast.” He knows what he’s talking about. The man is a taxidermist, after all. That last bit, we’re allowed to imagine. I saw Behind the Door at Cinefest 33 in Syracuse, NY; March 16, 2013.